Happy Friday everyone! This week I’d like you all to meet Joanne. I’m happy to be able to share some of her beautiful cards with you (including some love themes to help get you geared up for Valentine’s Day) here today. Joanne has a blog chock full of more terrific work so be sure to pay her a visit at www.sleepyinseattle.net and of course you can leave her some love here at the end of this post too. I think it has been 10 years already. A friend brought me to a stamping party and I was hooked right away. Yes, I have the stamp room of my dreams. When we were out house hunting and I saw this home with a room with a wall of built in shelves, I knew it was the one for me. We have recently completed a renovation with new paint all around and new carpet. I am in my happy place here! 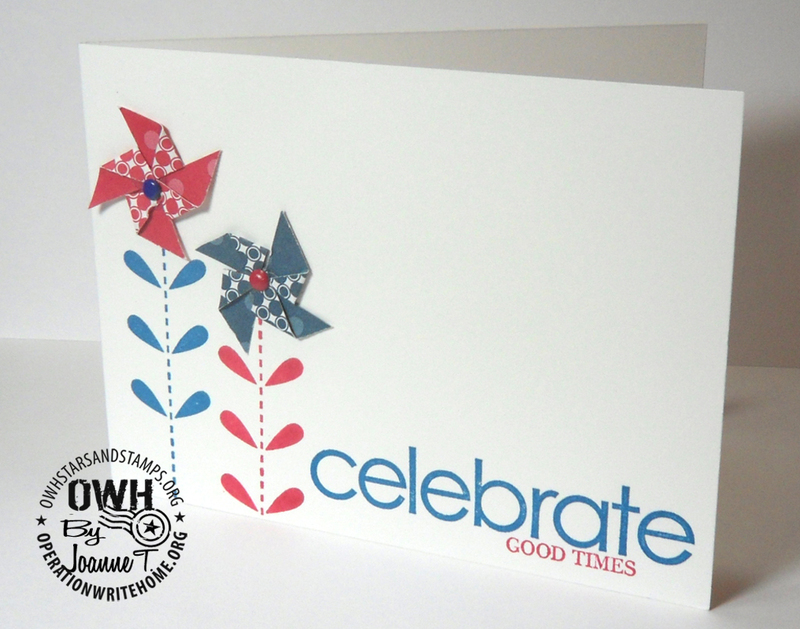 I love so many different company’s products, the stamp and paper selections just keep getting better all the time. I am really partial to Stampin’ Up and mostly buy from them, they are my absolute favorite! 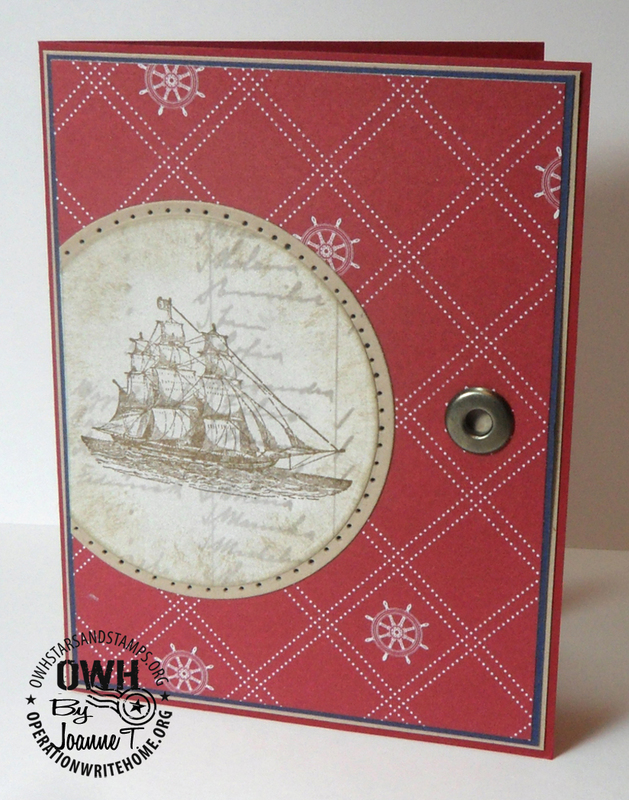 I think my most used product is the Big Shot and all of the different dies and embossing folders. I think my favorite technique is learning new techniques! Don’t be afraid to try new things. Whenever I get stuck with a creative block, I go to my favorite websites and challenge blogs and pick a technique I’ve never tried before or pair up a new sketch with a specified color combination or theme. It really helps you to get some focus and get your creativity going again. I love red! I think my favorite color combination is black, white and red, followed closely by chocolate and pink. I heard about OWH on a blog but I can’t recall which blog it was. I have the greatest respect and admiration for our military and their families. What they do for us is amazing and I don’t know how I could ever express the gratitude that is in my heart. I pray for them daily and I hope that I can bring some joy by sending cards so they can keep in touch with their friends and family when they are so far apart. Note: while standard A2 cards are preffered by OWH square cards are accepted but please be certain to include an envelope to fit your card. Shipper’s do not have square envelopes readily available and without an envelope they cannot be sent for use by our heroes. I like your cards. They are clean and simple but have enough demension to make them interesting. I really like the deer and bear stamped ones, so cute. Really love your cards. Nice layouts and colors. Uncluttered, striking. Joanne, what beautiful cards! I especiall like how you took the bear and made him patriotic! I am going to use you idea about what you do when a creative block hits! Thanks for sharing your wonderful talent! Beautiful work on these cards…they're absolutely stunning!!! I love how you used little hearts behind the big heart. I will be definitely case-ing that! The ship card is gorgeous! TFS!!! Your cards are beautiful; if I had to choose a favorite, those tiny pinwheels really caught my eye! 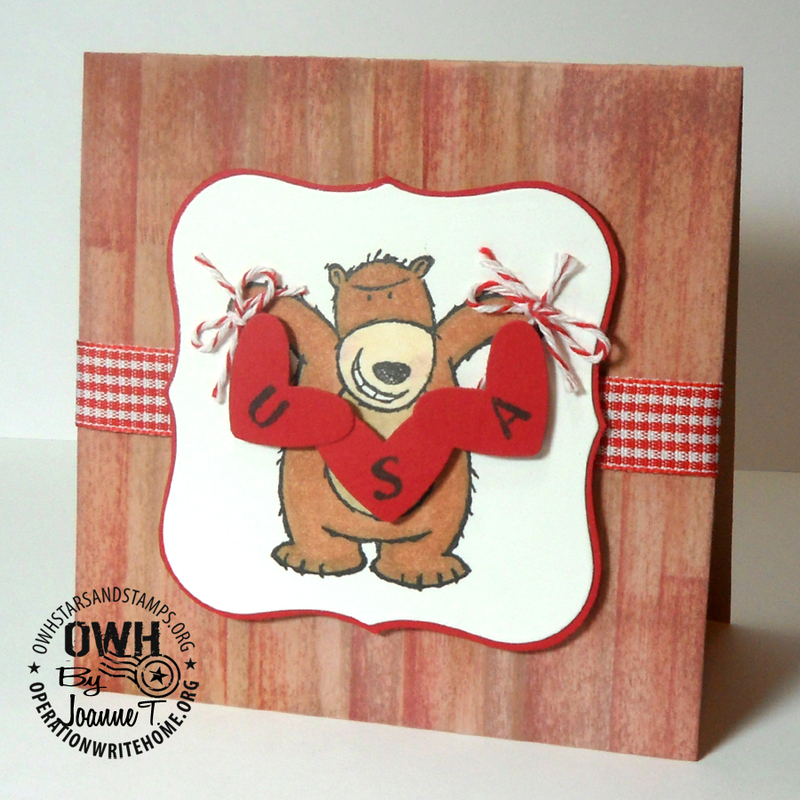 Fun to read your cardmaking story, too! Superb as always, Joanne. I follow your blog and love to see your creations. These are exceptional–really like the first two's texture and layouts, and the ship card is wonderful! I caught your craft room pictures on your blog and you're one lucky lady! It looks like a wonderful space. Lovely cards, Joanne! 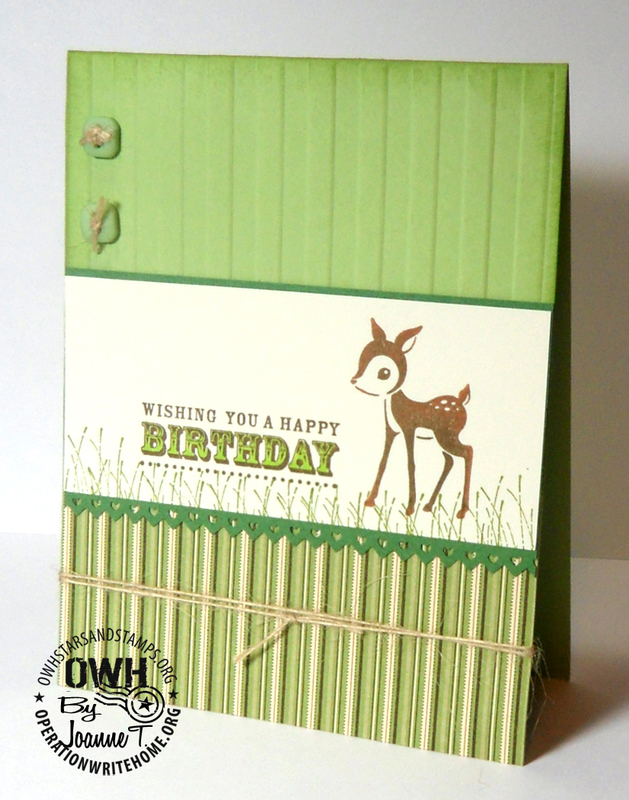 I especially like the airy simplicity of your pinwheel card! Thanks for sharing them with us! Joanne, these are all so beautiful. Every one of them strikes a perfect balance… bold and crisp but with enough detail to capture the eye. Thanks for letting me share your cards with everyone this week Joanne. Love your cards. So fun and clean looking. I will be back to your blog in the future to see what you're up to. Your cards are beautiful! Congrats on being featured this week. I know you sure inspired me! Great cards! I especially like the red/pink/brown variations. The heart is my favorite. 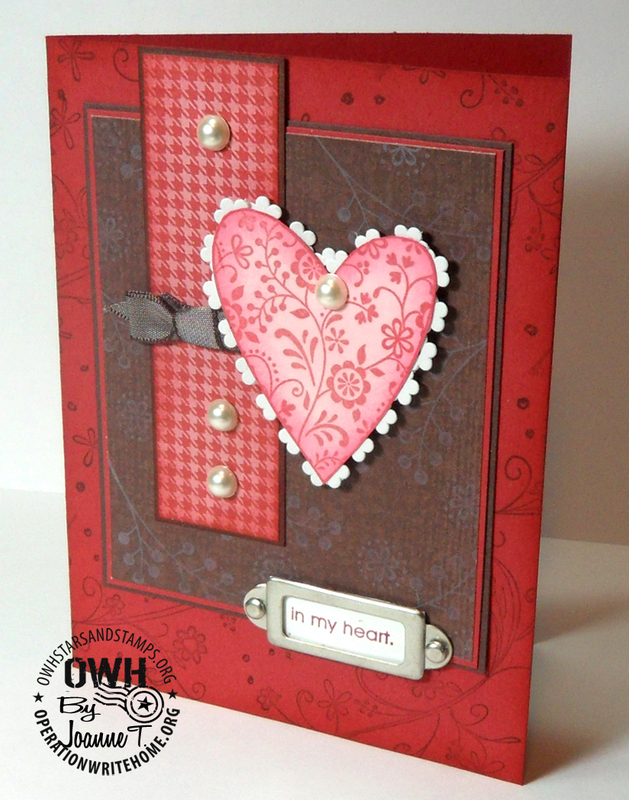 Love the heat and dry embossing and really great color combos through out. TFS! Joanne, Your cards are lovely! I love them all,but the "In my heart" and ship cards really caught my eye. The brad on the ship card~really nice! Thanks for sharing! 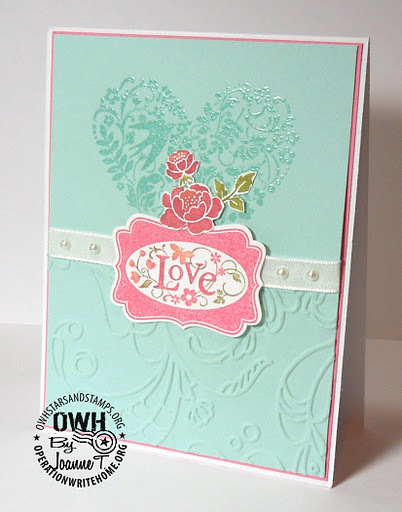 Joanne, your cards are all so beautiful – great color combos, embossing and layouts on all. Thank you for sharing your wonderful cards and for all you do for our heroes!